Nathan Fillion really only plays one character - the charming but flawed rogue with a quick wit and a heart of gold - but he plays it very, very well. It's a character he made into the heart and soul of Firefly, and now he's brought it to Castle, a lighthearted cop show in which he stars as mystery writer Richard Castle. Thanks to a friendship with New York's mayor, Castle is allowed to follow homicide detective Kate Beckett around - and of course he can't help but pitch in on the investigations. A realistic portrayal of policework, Castle is not, but the cast, including the lovely Stana Katic as Beckett and Susan Sullivan as Castle's mother, has marvelous chemistry and great comic timing. The banter is consistently enjoyable, sure to entice a few chuckles out of you each and every episode. If you miss the easygoing camaraderie of Firefly, and don't mind a bit of fluff mixed in with your mysteries, you'll likely enjoy Castle. It's a common dilemma: You want to declare your love of Firefly to the world, but you want to do it in an understated way that underscores your outward cool. No problem. 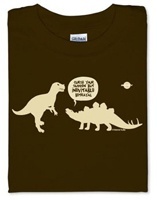 This shirt, featuring a conversation between Wash's toy dinosaurs, communicates your love of Serenity's crew in a way that only fellow Browncoats are likely to recognize. (Yes, there's a small Serenity logo on there, too, but if someone is close enough to read that, hopefully they're already a friend of yours.) "And we will call it...this land."